Summer Pudding is probably my favourite British pudding. There is something about the sharpness of the fruits and the tender bread shell soaked with juice that really appeals to me, especially when doused with a liberal pouring of cream. 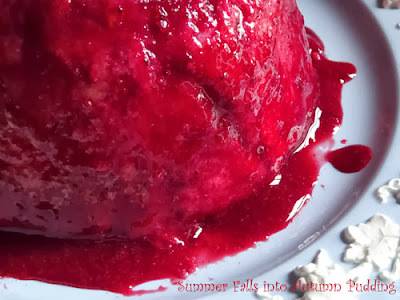 For some reason I didn't make a summer pudding this summer so I thought I'd bridge the seasons with a summer into autumn version. 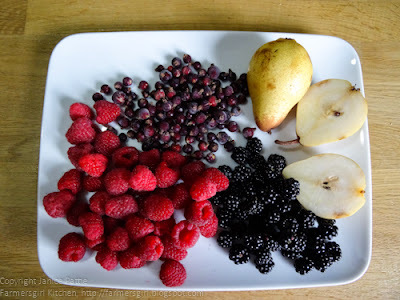 I had two ripe pears in the fruit bowl, a punnet of raspberries, brambles (blackberries) from my hedgerow and some blackcurrants from the freezer, any combination of soft fruits will do, you want ones that will produce lots of fruity juice. Half a loaf of white bread. 1. Slice the bread and cut off the crusts. Line a 1.25ltr pudding basin with cling film making sure you have plenty over the side, this helps you to remove the pudding more easily when it is ready. 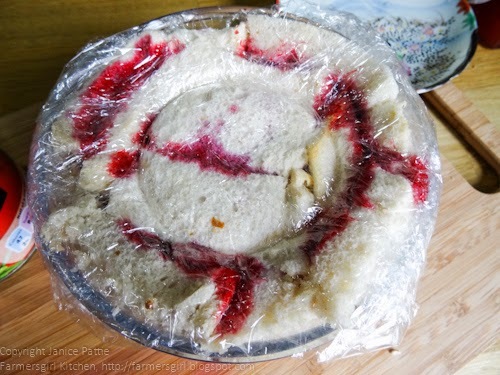 Line the cling filmed bowl with bread, filling in all the gaps. 2. 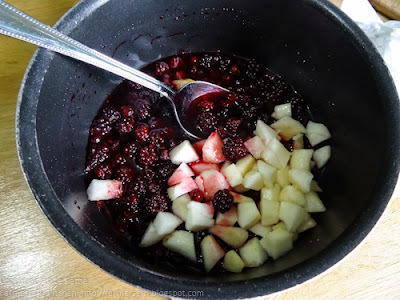 Put the blackberries and blackcurrants into a pan with the sugar and just enough water to cover the berries and no more. Heat gently until the sugar has dissolved and the berries have started to release their juices, about 5 minutes. Add the peeled and chopped pears and the raspberries and simmer gently for another 2 minutes. 3. 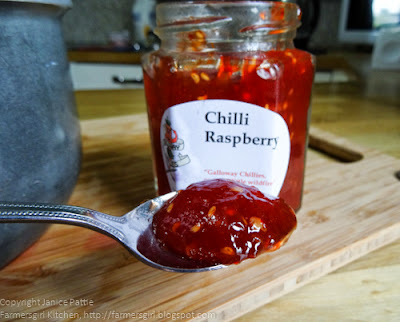 Add 1-2 tsp of Chilli jam, I used Galloway Chillies 'Special Edition' Chilli Raspberry Jam. 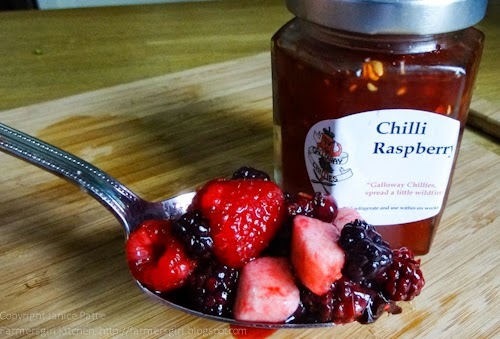 I found that 1 tsp wasn't really enough to give a kick, so I would recommend at least two, but it will depend on the type of Chilli Jam you use. This is of course, optional! 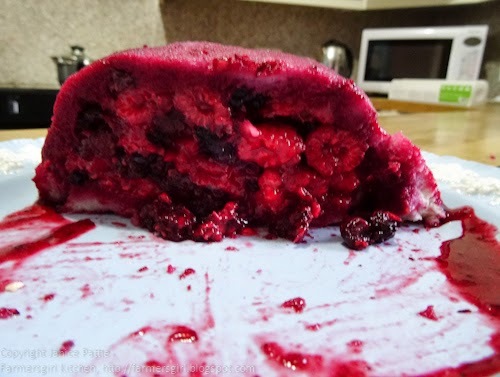 This is what the berries should look like, still whole and not cooked out. 4. Fill the bread lined bowl with the berries and lay more slices of bread across the top. Fold in the cling film. 5. 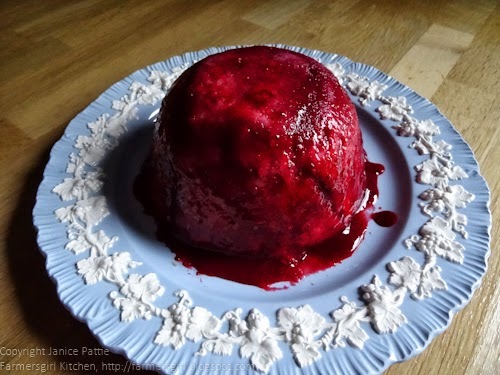 Place a saucer on top of the pudding and weigh it down with something heavy like a tin. Place it in the fridge overnight. 6. 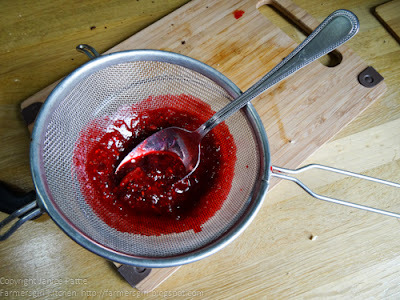 Place the remaining juice and berries in a sieve and press through to get all the juice and pulp. 7. Add a tablespoon of Framboise (Raspberry Liqueur), Cassis (Blackcurrant Liqueur) or Creme de Mur (Blackberry Liqueur) - not all of them just one tablespoon! This is optional, it will still taste gorgeous without the alcohol. 8. 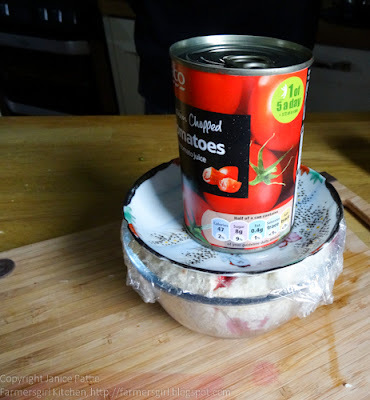 Unwrap the cling film from the top and turn the bowl onto a plate lift off the bowl and remove the cling film. 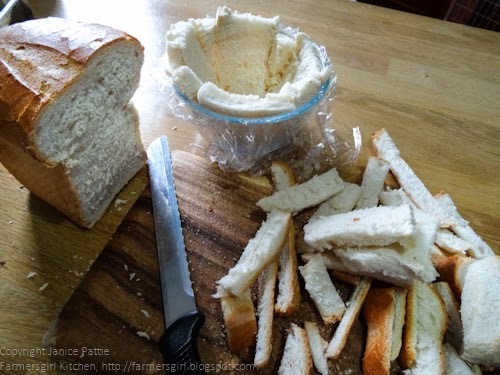 I used a pastry brush to paint the bread with some of the sauce or you can spoon it on to cover any patches where the juice hasn't seeped through the bread. 9. Cut into slices and serve with the remaining sauce and some pouring cream. I was really pleased with the way the pudding cut and held together, it may have been the pear which helped to hold it all together. 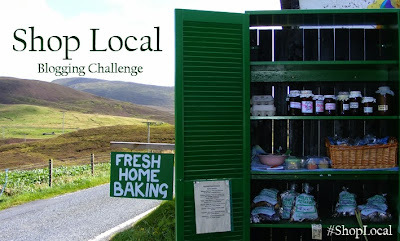 I'm also adding my Summer Falls into Autumn Pudding for Shop Local a new blogging challenge from Elizabeth's Kitchen as it features Chilli Raspberry Jam from local producer Galloway Chillies. Galloway Chillies produce a range of delicious chilli jams and the Hot Chilli lemon Citrus has recently been awarded a gold star by the Guild of Fine Food at the Great Taste Awards. simply stunning. A fab idea to make this seasonal and I think I may follow suit too... lets try and make up a winter one and how about a savoury one? Gorgeous colours and I bet it tasted incredible! I guess you could make a winter pudding or a savoury one as long as there is enough juice, it would also have to be colourful or it wouldn't look good. A savoury one featuring tomatoes as main veg would be good. I look forward to seeing what you come up with! Thanks for this recipe . 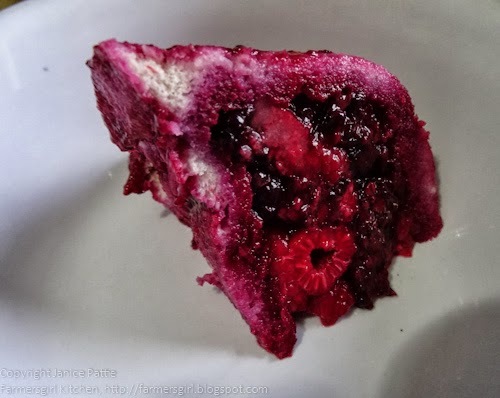 I love summer pudding, and it's really handy for making ahead when you have guests. 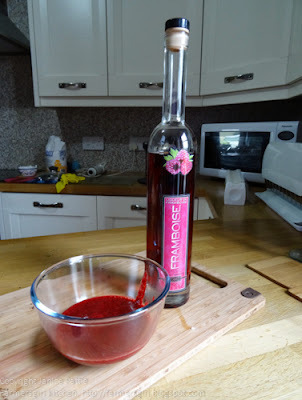 I fancy making this with last years leftover sloe gin. Btw I always soak my bread in the juice from the fruit before lining the baisin to avoid white patches!